Keiko Raca has been around for a long time, mostly known for their BJJ gis but they have ventured into producing Vale Tudo Shorts and now, the Keiko Raca Muay Thai Shorts. Made with a 100% authentic Thai construction, these shorts are made with traditional Thai nylon used by Muay Thai fighters from the region. 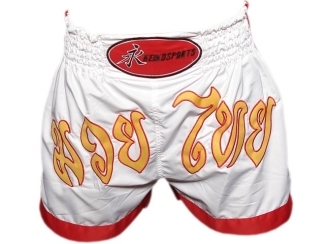 The wide waistband allows for a snug fit, and features Muay Thai script on the front. The Keiko Raca Muay Thai Shorts come in either white or yellow. The Keiko Raca Muay Thai Shorts are available from MMA Outlet.